Answer the 4 customizing questions in the box below. See listing pictures for fonts & thread colors to pick from. 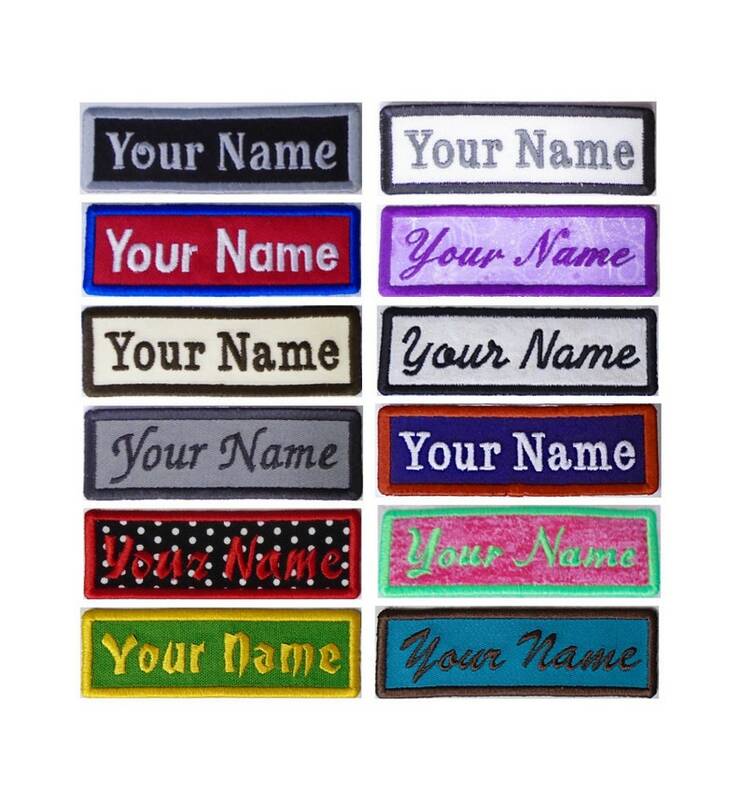 You can customize the applique patch with 1 line of text or your name, letter thread color and outline border thread color. You can apply to clothing, backpacks, towels, blankets, purses, hats, diaper bags, tote bags, luggage, Christmas stockings and more. These patches have an iron-on Fuse-N-Bond on the backside which is a fusible film that attaches the patch to most fabrics. Do not dry on high heat since the iron-on backing is heat activated. If washing it is recommended that you sew the patch on after ironing it on for the best long term hold. You can also use patch glue or FABRI-TAC GLUE which is recommended to adhere the patch to you item. On the size section it will tell you the maximum amount of letters you can have for each size patch. You can have less letters but not more than the amount stated for each size. Each applique patch is handmade and embroidered in the USA! 16 font choices in picture: Serif #1, Cursive #2, Old English #3, Bold Script #4, Brush Script #5, Medieval #9, Slant Block #10, Block Font #13, Fancy Script #17, Saipan #33, Cairo #49, Calligraphy #50, Cypress #55, Kingston #71, Riesa #80, Totally Gothic #119. Perfect size and color!!! Thank you! Items will not ship until all payments are cleared first. No exceptions. All sales are final on custom embroidered items because I can not resell the items after I customize it for you. If the item you receive is defective or damaged or I made a mistake on the personlization contact me within 7 days and I will send a new one out. If item is out of stock or no longer available, a refund will be given. Non-custom items can return within 14 days after receive the item in new condition that can be resold to qualify for a refund. Contact me within 7 days after receiving the items so I know to keep an eye out for it in the mail. Buyer pays return shipping. Coins can return within 14 days after receiving the item. The exact coin in the listing picture needs to be sent back for a refund. Contact me within 7 days after receiving the item so I know to keep an eye out for it in the mail. Buyer pays return shipping and the coins need to have tracking numbers. Seller will not take responsibility for return coins lost in the mail so if it's an expensive coin you might want to insure it before sending it back. Custom embroidered items such as dog and cat collars are usually shipped within 1-2 week of purchase. Handmade jewelry is usually shipped within 2-3 days of purchase. USPS first class mail is used on small orders. Larger orders past 13oz will be shipped USPS priority mail. CHRISTMAS ORDERS HAVE BEEN CUT OFF. I'M NOT TAKING ANYMORE CHRISTMAS OR RUSH ORDER REQUESTS RIGHT NOW. I'm only offering what's in my shop listings for online orders. Order are done in the order received. I will not do obscene or profanity wording for custom embroidered items. Any obscene or profane orders will be canceled and refunded.